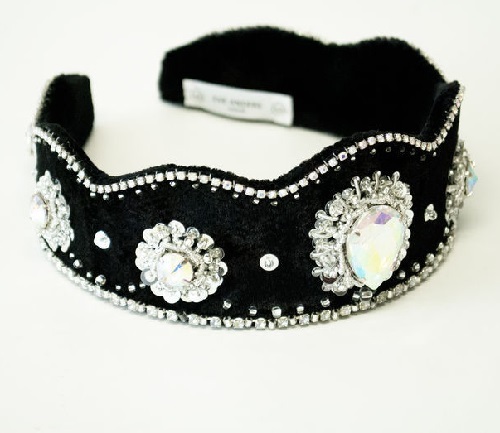 Eva Anders is a fashion designer and founder of the Eve Anders brand and design studio, located in Tallinn, Estonia. 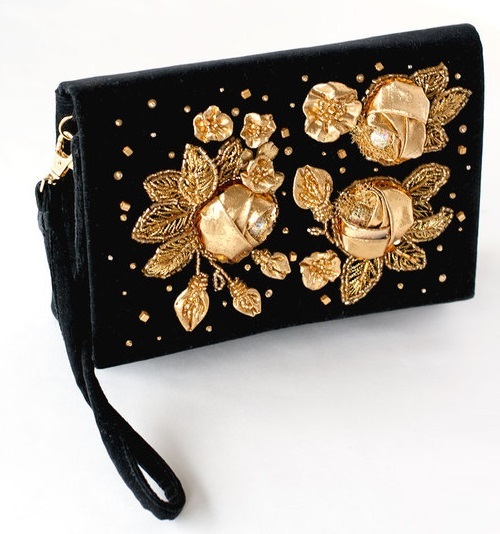 Eva has made the traditional craft of sewing mastery – Haute Couture art celebrating feminine beauty. 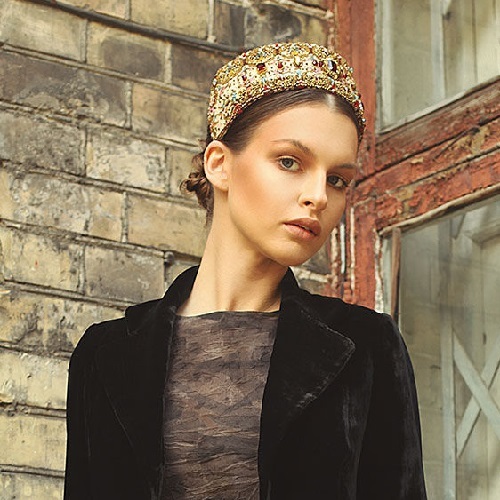 She got her art knowledge during lifetime in The Art School, the Gold Embroidery School in Saint-Petersburg, and the Ricamo Alta Moda School in Rome, where she was trained unique design, quality, comfort, and fair production. In 2011 Eva Anders established The Eve Anders brand and design studio in Tallin. Eve Anders products are often called Eco Fashion Couture, as every item is handmade of natural and vintage fabrics, in traditional old time techniques by skilled masters. 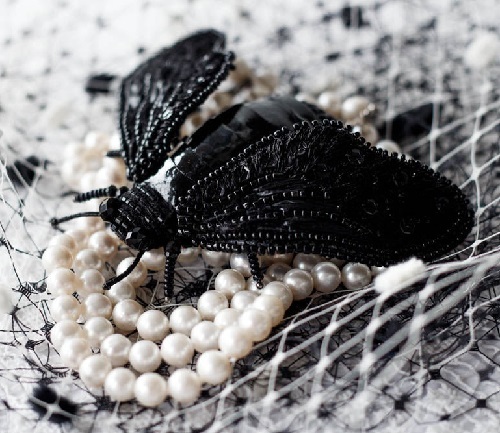 Eva Anders insect brooches are inspired by nature and the style of the great Elsa Schiaparelli. 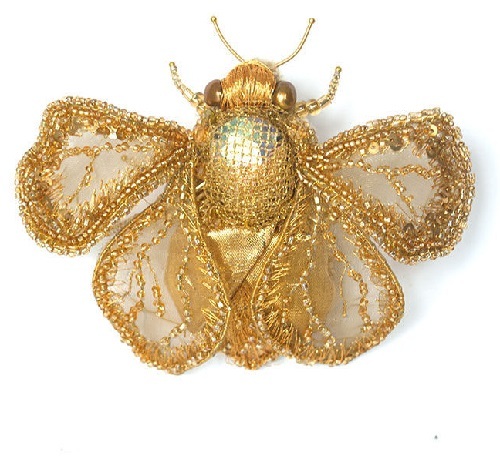 The sample of jewelry gold embroidery, insect brooches accentuate the unique taste of the hostess, wrapped in golden halo of mystery. 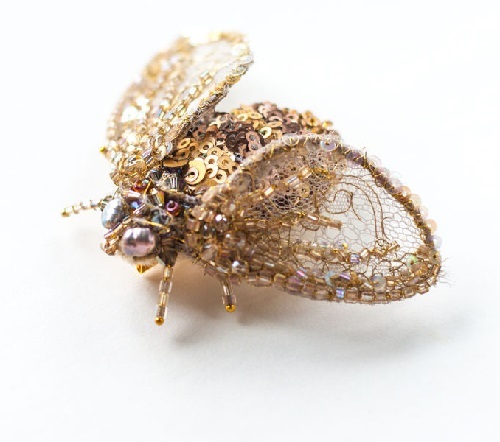 Volume Brooch Cicada Kee. 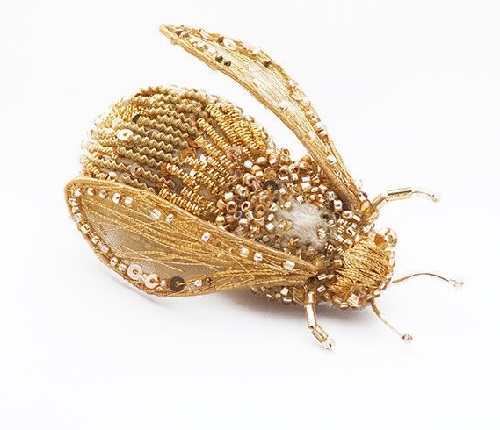 The upper wings embroidered with raffia, chenille yarn, metallized and silk strings, beads, stones and Swarovski paetki. 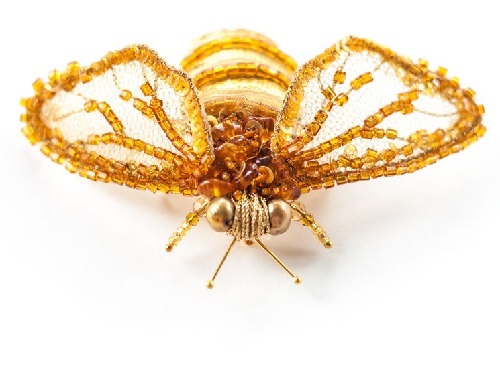 Smaller golden wings are very light and transparent, thin golden embroidery. Hearing one of these beautiful insects singing in a park in Shanghai, one could not stay indifferent. 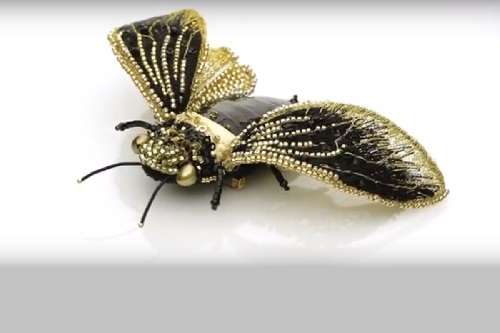 In Greater China this insect was considered a very positive talisman, as a symbol of eternal life and youth. Now in China, the cicada is considered a very popular symbol, and is widely used not only as a symbol of eternal life, but also to restore depleted luck. 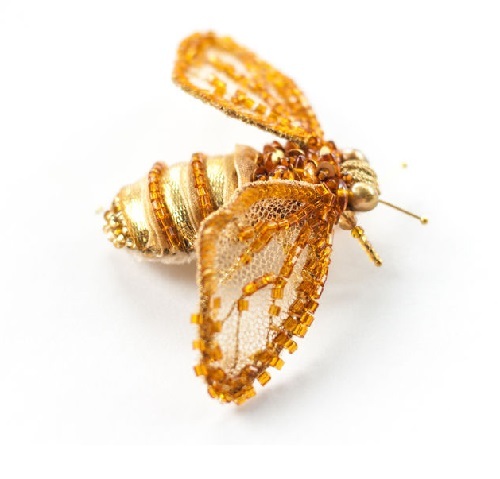 Cicada symbolizes the “great return”, it can help you relive the most beautiful and happy moments of your life. 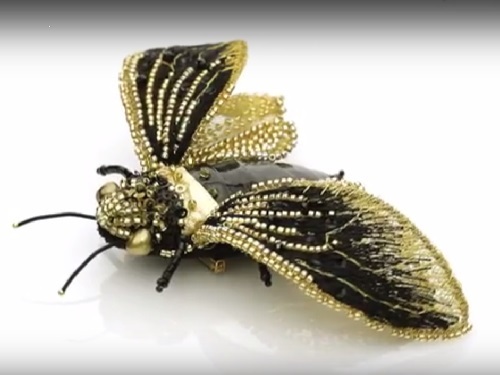 Hand embroidered brooch Cicada of absolutely exquisite workmanship shimmering in different shades of gold and black. Furthermore, cicada is a symbol of protection. 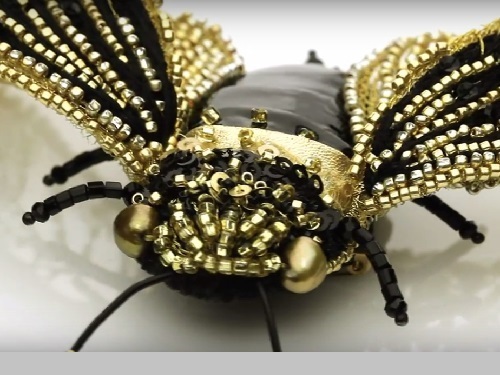 It is said that if you wear a cicada decoration, then promptly receive a warning and will be protected from the dangers caused by the approach of an enemy or treacherous friend. Now cicada is widely used in the world of politics for the protection of political intrigue. In this regard, cicada can be considered an amulet. Volume Diptera brooch Nero. The upper wings embroidered with a variety of materials such as raffia, chenille yarn, metallized and silk strings, as well as beads, paetki. 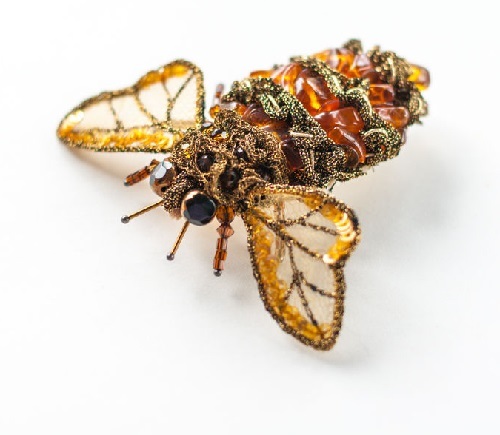 Amber-bronze brooch Bumblebee Jarek. Embroidered in a variety of techniques and of various materials. 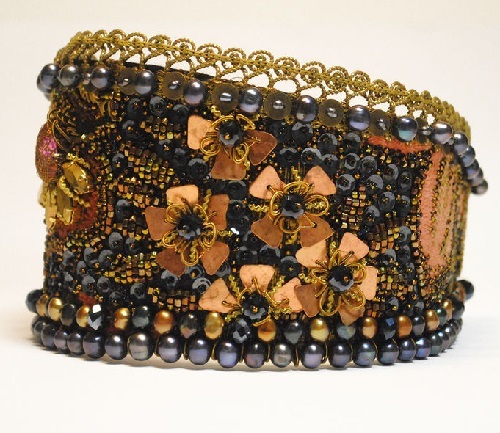 Amber, gold thread, gimp, metallized old ribbon. 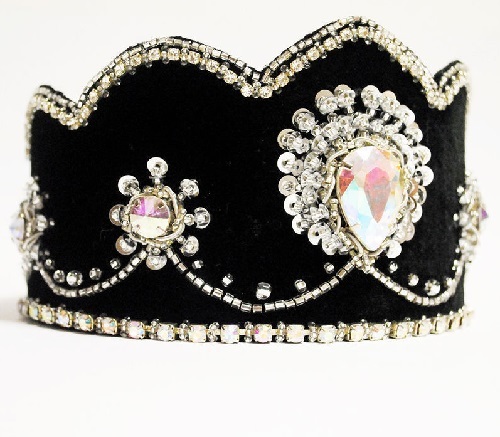 The back of the brooch is made of velvet. 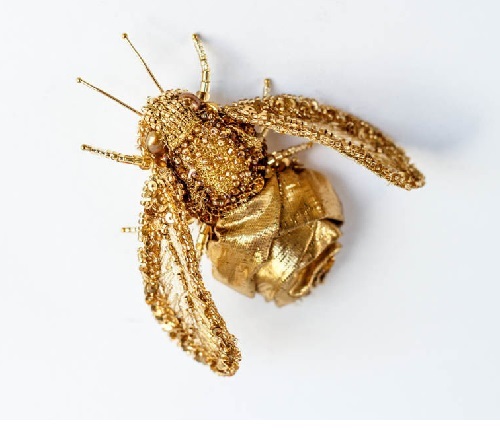 Brooch Bee Blanca – crystal bead embroidery performed in the author’s technique of bulk gold embroidery from different vintage and modern materials. 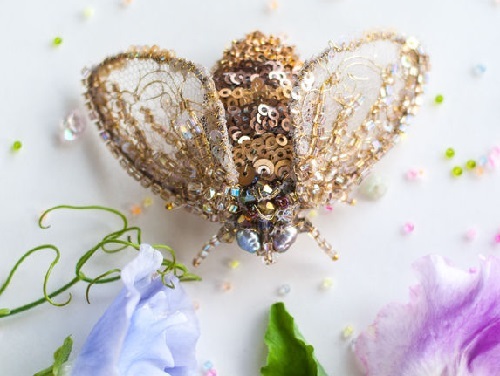 Eyes-pearls of dusty rose color, Sophie Hallette lace, wings and body of a bee are decorated with a variety of shimmering glass beads and sequins, six thin legs of beads. 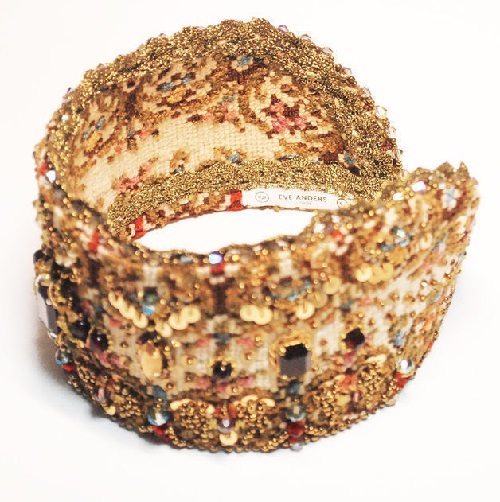 Eva Anders kokoshniks of stunning beauty are distinguished by the abundance of precious and semi-precious stones and materials – natural black pearls and crystals, beads and a variety of vintage beads of different shades – from honey to gold antique bronze. Hand embroidery of vintage copper paetki of several types and spun, including brass. 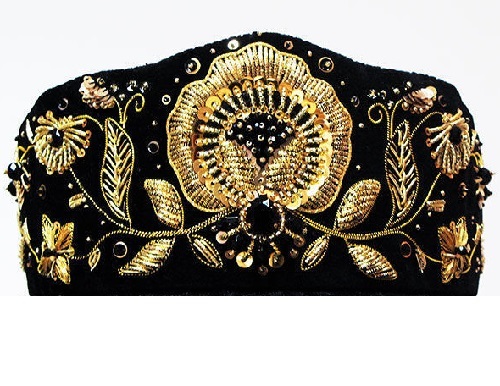 Vintage lace, metal thread, Swarovski stones, fabrics and vintage tapestry collected for many years from different parts of the world, from different treasuries and chests. 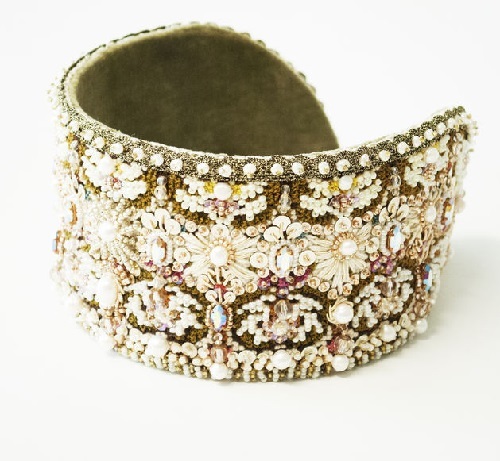 Each detail, each bead of kokoshnik has its history and filigree work of the master.